Anyone who has been keeping up with the blog will understand how our East Coast trip has been labelled the “worst ever.” Somehow, we managed to do everything wrong. We had fun, that’s undeniable, but it felt more like smiling through adversity than pleasure for pleasure’s sake. More than once, Sarah turned to me and said, “Are we being tested?” If we have been, we must have passed, since the rewards of the past few days have wiped any misery from our minds and put the adventure back into high gear. Neither Sarah nor I count ourselves as major gamblers. In fact, Sarah has never been to a casino before and my experience is limited to cruise ships and a very poor run at Casino Niagara (not even the beautiful Fallsview casino, but the other one.) Nevertheless, we decided to treat ourselves with one night out at the awe-inspiring Crown Casino in downtown Melbourne. We ate dinner in one of the bistro-style restaurants there and were feeling lucky. We entertained the idea of winning enough money to buy us last minute tickets to the Australian Open Men’s Final (about $250/each) and headed straight to the slots. Five minutes later and twenty dollars poorer, we abandoned slots as a slippery slope into debt. Instead, we decided to try our hand at blackjack. After watching a couple of rounds, we each put in twenty dollars and made the attempt. We just managed to crack even and decided to call it a night. But is it ever easy to call it a night in a Casino? With one last vain hope, we sat down at a different table. Now our luck really changed! When we finally decided to finish “for real,” we were up $200 and feeling good. It wasn’t enough for tickets, but it would cover our grounds passes, dinner and a taxi home. We were happy. As a huge tennis fan, I’ve been following the Australian Open with something bordering on religiousity. I’ve found TV’s or bars at every hostel in order to keep up with the scores, especially concerning my favourite player, Roger Federer. Naturally, I was really disappointed by his loss to Djokovic in the semi-finals, but I was excited to be in the same city as a Grand Slam final. On the evening of the men’s final, we decided to go down and watch it from the big screen TV on the grounds and support underdog Jo Tsonga. 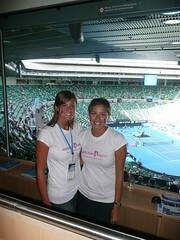 Armed with facepaint and matching Australian Open t-shirts, Sarah and I descended on Melbourne Park. Only a couple of minutes into our stroll to find the big screen TV, but two men approach us asking about our facepaint. Sarah and I bought the facepaint for $2 at a dollar store, so we offer to paint their faces (on the condition that it be French flags) instead of them waiting in line at the official face paint booth. After chatting for a bit about how we are poor tennis-loving backpackers with only lowly grounds passes, they offer to try and sneak us into their superbox. An offer we can’t refuse! With a little help from their wives and families up in the box already, they manage to procure a couple of passes for us to use in the elevators passed the tight security. Once up there, we don’t dare to venture down again – but there was really no need! We had unlimited food and drink and the best seats in the house. We got to watch the mixed doubles final and the men’s final and both games were incredible. An experience we will never forget. All down “Steve Irwin Way,” Steve’s permanently surprised face greets us as we head to Australia Zoo. The zoo is his legacy, and its reputation precedes it – Lonely Planet hypes it as a “world top ten,” and that’s not just for zoos, but for destinations. It has a lot to live up to, but it succeeds – and in many ways it surpasses our expectations. 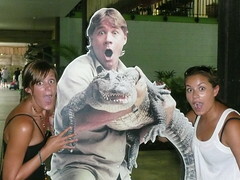 What is the main attraction for a zoo owned by the Crocodile Hunter family? 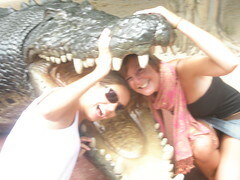 Alligators of course! Jokes aside, crocodiles are everywhere. Huge, pristine enclosures hold one or two crocodiles each; it is a startling change from the croc enclosures in Botswana and Tanzania where hundreds of crocs swarmed en masse in dirty water. The crocodile show is exciting and different. No matter how long these massive reptiles have been in captivity, none of them seem remotely tame, and the trainers are clearly nervous and treat these animals with respect. Even though “Graham” the croc is being gentle today, the few strikes he makes at the trainer (who is bravely dangling what looks like a rasher of bacon in front of Graham’s jaws) clearly showcase their enormous power. Three hundred pounds of pressure is contained within those torpedo-like bodies. Mixed with the displays of power is a discussion on how to deal with crocodiles in the bush. It’s scary to think about how some of the world’s most dangerous animals are a part of daily life for some families, especially in the Northern Territories and outback Queensland. In fact, as I wander through the “Venomous Snakes” enclosure, I overhear a conversation between a man and his son. They are looking at the taipan, one of the most venomous snakes in Australia. The man turns to his son and says, “Now see what I told you? Next time you see one of those on the farm, you stay away.” Scary. The other main focus of the Australia Zoo is conservation. Throughout the day, Bindi, Robert and Terri Irwin deliver TV messages about the importance of preserving the planet. As visitors to the Australia Zoo, we have all been entered into the league of “Wildlife Warriors.” Some of the videos play like the Irwin family home movie time, but you can’t help but be caught smiling at their slightly off-kilter, over-the-top Ozzie antics. And their intent is better than good. Allow people to interact with animals, fall in love with them and then want to help them. It works with us. We are in line for the koala photos, the bird of prey shows, the elephant feedings and the tiger temple. We are spending our hard saved backpacker dollars, and anything that makes a traveller part with their dough must be worth it. The Australia Zoo is. My favourite animal? Why, the little echidnas of course! 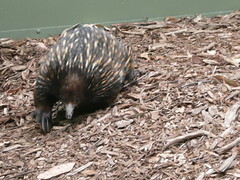 Half-hedgehog, half-duck, they are the weirdest, wackiest animal in Oz. And pretty darn cute as well. Brisbane has seemed this impossible goal, but finally we have made it. It has probably been the most harrowing few days of my life so far. We were stranded in Airlie Beach for one night and fortunately were able to make a break for it by tagging along with Rob and Kara, the Canadians we met on the Anaconda III. We ended up in Rockhampton, a small town about halfway between Airlie and Brisbane. After many fruitless calls to Greyhound, we soon realized we weren’t going to be getting to Brisbane any time soon – all the buses were completely full from the backlog at Airlie Beach. Instead we decided to rent a car to take us the rest of the way. Unfortunately I ended up in a car accident after one of the back tires skidded off the road. Sara and I both walked away with scratches and bruises but no major injuries. We were lucky. I am so grateful to my friends Chris and Hilary for coming to pick us up from Brisbane. I don’t know what we would do without such amazing support over here. So a huge THANK YOU to them, and a huge sigh of relief that we are finally in Brisbane… safe and sound.